We’d love your help. 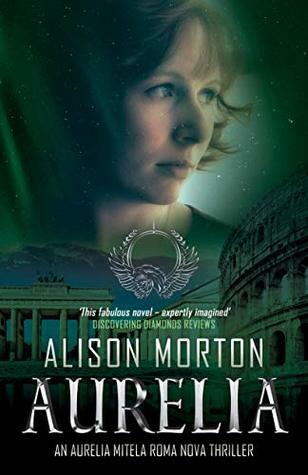 Let us know what’s wrong with this preview of Aurelia by Alison Morton. 1960s Roma Nova. Retrained as an undercover agent, ex-Praetorian officer Aurelia Mitela is sent to Berlin to investigate silver smuggling, but barely escapes a near-lethal trap. Her lifelong nemesis, Caius Tellus, is determined to eliminate her. When Aurelia is closing in on him, he strikes at her most vulnerable An alternative cover edition for this ASIN can be found here. 1960s Roma Nova. Retrained as an undercover agent, ex-Praetorian officer Aurelia Mitela is sent to Berlin to investigate silver smuggling, but barely escapes a near-lethal trap. Her lifelong nemesis, Caius Tellus, is determined to eliminate her. When Aurelia is closing in on him, he strikes at her most vulnerable point – her young daughter. A former military commander, Aurelia is one of Roma Nova’s strong women, but she doubts in her heart and mind that she can overcome her implacable enemy. And what part does the mysterious and attractive Miklós play – a smuggler who knows too much? If you enjoy reading mystery books for women with plenty of twists and a female protagonist driving the action, this is for you! First in the Aurelia Mitela adventures, where Roman fiction is brought into the 20th century through an alternative history lens. INSURRECTIO and RETALIO follow on. To ask other readers questions about Aurelia, please sign up. Having read the first three books in this series, I was absolutely eager to move on to the next book! The first three books in this series focused on Carina Mitela, Aurelia's granddaughter, but there were plenty of tasty hints to a rich past, and now we finally get to explore the history of both Aurelia and Nova Roma. While the first three books (which could be considered a trilogy) was set in current times to what I figure to be the 2030's, this is set in the 1960's, in Aurelia's own youth. Some Having read the first three books in this series, I was absolutely eager to move on to the next book! The first three books in this series focused on Carina Mitela, Aurelia's granddaughter, but there were plenty of tasty hints to a rich past, and now we finally get to explore the history of both Aurelia and Nova Roma. While the first three books (which could be considered a trilogy) was set in current times to what I figure to be the 2030's, this is set in the 1960's, in Aurelia's own youth. Some futuristic technology was introduced in previous books, but the author keeps it real by keeping the innovations Aurelia has access to reasonable for the time period. The economy and political structure, and the importance of silver, is also explored in this book, fleshing out the world of Roma Nova. I really enjoyed this book, and while there was a good adventure in it, more is hinted at, and as I already have the next two books - Insurrectio and Retalio - I am eager to read more of Aurelia's story. And with titles like Insurrectio and Retalio, you know that ooh, dis gun b gud. This is (I think) the fourth book in the author's Roma Nova exciting alternate history series. I've read her first book, Inceptio, but not the other two - even so, I had no trouble picking this one up since it tells some of the backstory to the earlier books. This book tells the story of Aurelia, the grandmother of Carina from the earlier novels, and we begin to get a clue about how Carina's mother might have ended up in the E.U.S. The book grabbed me from the very first page - I started reading This is (I think) the fourth book in the author's Roma Nova exciting alternate history series. I've read her first book, Inceptio, but not the other two - even so, I had no trouble picking this one up since it tells some of the backstory to the earlier books. This book tells the story of Aurelia, the grandmother of Carina from the earlier novels, and we begin to get a clue about how Carina's mother might have ended up in the E.U.S. The book grabbed me from the very first page - I started reading it while waiting to board a plane and I have never been so grateful for a five hour plane ride that I could devote solely to reading. The author takes us into Roma Nova, Prussia, and Austria in the 1960s as our heroine tracks silver smugglers, thugs, and assorted other criminals while trying to keep her young daughter from the clutches of her sociopathic nemesis. The author's lively writing means there is never a slow moment in this book. I have read all the books in the Roma Nova series focused on Carina. With Aurelia , I begin a prequel trilogy taking place in the 20th century and centering on Carina's grandmother, Aurelia Mitela. I liked what I saw of Aurelia in Carina's books. So I was happy to receive the first book focusing on her as a gift from the author via Book Funnel, and this is my honest review. When I compare the two protagonists in the Roma Nova series, I have to say that I prefer Aurelia. I feel that Aurelia is mor I have read all the books in the Roma Nova series focused on Carina. With Aurelia , I begin a prequel trilogy taking place in the 20th century and centering on Carina's grandmother, Aurelia Mitela. I liked what I saw of Aurelia in Carina's books. So I was happy to receive the first book focusing on her as a gift from the author via Book Funnel, and this is my honest review. When I compare the two protagonists in the Roma Nova series, I have to say that I prefer Aurelia. I feel that Aurelia is more level headed, and that she has better judgment than Carina. I perceive both of them as strong women with differing approaches that were shaped by their experiences. I look forward to continuing to explore the differences between the way Carina responded to situations, and how Aurelia reacted to similar circumstances in the two remaining books of the Aurelia trilogy. I am constantly amazed by Alison Morton's ability to produce a new spell-binding tale after what I thought was a pretty extensive exploration of the alternate reality world of Roma Nova. If you have not yet read the previous books, do yourself a favour and start with Book 1, INCEPTIO. Despite the fact that this is a prequel to the other three books, it will be so much more rewarding to follow the events from the beginning because there are many characters and much background information to assim I am constantly amazed by Alison Morton's ability to produce a new spell-binding tale after what I thought was a pretty extensive exploration of the alternate reality world of Roma Nova. If you have not yet read the previous books, do yourself a favour and start with Book 1, INCEPTIO. Despite the fact that this is a prequel to the other three books, it will be so much more rewarding to follow the events from the beginning because there are many characters and much background information to assimilate for this story to be fully appreciated. Book Four of the Roma Nova series takes us back in time two generations before Carina, to catch up with the then-young Mitela matriarch, Aurelia. She is 29 when the story begins, the doting mother of a fragile, sickly little girl of 5 (Carina's mother). Aurelia is a physically intimidating, tough army career soldier, currently serving under the rank of Major. If you thought that Carina was a formidable female character, prepare yourself for a mind adjustment. Where Carina had to play catch-up to develop her new-found skills, and struggled to reclaim her inherited role, Aurelia has grown up in a position of privilege and power, practically step-daughter of the Imperatrix and finding herself prematurely the head of the senior of the Twelve Families which founded the tiny but technologically-dominant state of Roma Nova. Aurelia has a fierce enemy, a twisted and perverted personality, who delights in inflicting pain and will stop at nothing to destroy her. He reaches out with super-human efficacy and manages to wreak havoc in her life on several occasions. Against a background of shifting allegiances and uncertain relationships, silver trading, the lifeblood of Roma Nova, is threatened, and Aurelia's service to the state places her in mortal danger. Clearly, since we have encountered Aurelia as a mature stateswoman in the first three books, we know that she must have escaped all the attempts on her life, however, it is still brilliantly entertaining to read all about them. I can pinpoint when my fascination with ancient Rome began to the viewing of two movies, Ben Hur and Spartacus (yes dear readers, I am that old.) Nowadays I get my Roman fix through the medium of historical fiction, and there is a lot of that to choose from. However, the idea that there could still be a remnant of that ancient favorite still extant and thriving is the basis for this wonderful series by Alison Morton, Roma Nova. A modern nation still bound by many of the old traditions and thrivi I can pinpoint when my fascination with ancient Rome began to the viewing of two movies, Ben Hur and Spartacus (yes dear readers, I am that old.) Nowadays I get my Roman fix through the medium of historical fiction, and there is a lot of that to choose from. However, the idea that there could still be a remnant of that ancient favorite still extant and thriving is the basis for this wonderful series by Alison Morton, Roma Nova. A modern nation still bound by many of the old traditions and thriving in the 20th century is what she has not only crafted but done so in such a way as to make you think it was possible. The fourth book, Aurelia, is a prequel to the first three and centers on the matriarch of the Mitella family and like her namesake, the mother of Gaius Julius Caesar, she is a formidable character. In the first three books, she is an older woman but still full of wisdom and strength; in the fourth she is a young woman coming into her own as she finds herself thrust into an international plot to undermine the economic stability of the nation and a plot to undermine the matriarchal society that Roma Nova has become. All of that plus the threat to her life and of that of her family makes for an intense drama built upon the imaginative characters the author has created. The action and drama is relentless; the climatic conclusion is heart-stopping stuff - in other words; I enjoyed the first three books tremendously; the fourth even more so. Kudos to the author and a well deserved 5 stars. Written in the first person, Aurelia’s bold personality and brave, active life as a Major in the Praetorian Guard Special Forces engag Aurelia is the fourth book in Alison Morton’s Roma Nova series. Set in an alternative historical context, the Roman Empire survives as a matriarchal society in a semi-mountainous area north of Italy. This is the only book I have read in this series so far, but it features a different character to those used in earlier volumes and works well as a stand-alone novel. Excellent read! I was a little knocked off balance at first by seeing a character (Aurelia) as a young girl, when I last saw her in the earlier books as a very old woman. I got over that in a hurry and enjoyed a good read! We are proud to announce that AURELIA by Alison Morton is a B.R.A.G.Medallion Honoree. This tells a reader that this book is well worth their time and money! In her Roma Nova series, Alison Morton engages the query of What if, and world-building on the possible answers or results. Combining this with her own military experience and consideration of Roman women playing a more significant role than actual history shows, an installment such as Aurelia is born. Growing Aurelia, of course, requires the possession of its own history, and Morton deftly provides this. Following Theodosius’s 395 (AD) ban on all pagan religious observation, some four hundred Ro In her Roma Nova series, Alison Morton engages the query of What if, and world-building on the possible answers or results. Combining this with her own military experience and consideration of Roman women playing a more significant role than actual history shows, an installment such as Aurelia is born. Growing Aurelia, of course, requires the possession of its own history, and Morton deftly provides this. Following Theodosius’s 395 (AD) ban on all pagan religious observation, some four hundred Romans depart, setting up an infant society, Roma Nova, on the family-owned land of its senator, who leads the new colony’s twelve prominent clans. In her brief but fascinating historical note—wisely positioned at the start of the novel—Morton reminds us via Davies’s Vanished Kingdoms that any fledgling state requires certain elements to ensure its survival, amongst them defense, naturally, but also a diplomatic force, revenue system and, the author adds, adaptability. The Roma Nova of Aurelia, set in the 1960s and populated by the descendants of the Twelve Families, has indeed looked after these interests: silver is their major export and they possess a hardy diplomatic corps, both of which come into play when Aurelia Mitela is sent abroad to investigate the price manipulation of this precious metal. Aurelia, mother to a sickly child and who also recently lost her own mother under suspicious circumstances, travels to a Berlin different in two major ways, one for her and one for us. Unlike the rest of Europe in this era, where women generally continue to embrace traditional roles, Roma Novan females are accustomed to being able to move into positions of power; indeed, Aurelia has a successful army career only recently put on hiatus. So she encounters a society unused to her authority and assertive demeanor, though without the fallout of an infamous Austrian-born corporal’s rise to terrible power, which in this alternate history never occurred. Bringing a reader from the opening of this conception to the point at which Aurelia embarks on her investigation is no mean feat. Morton packs many centuries of history into the backstory and narrative without overwhelming us, but allowing Aurelia to develop a rapport with us as we read. She is a “mere soldier,” though proud of her service. She understands her tiny country has always had to work hard and remain vigilant to overcome their vulnerability. She is embarrassed at her weight gain and worries about her small daughter, and that she cannot fill her late mother’s shoes and keep up with her new duties. Aurelia is sensitive but practical and as such, I didn’t entirely expect poetic-style passages in this first person narrative. Not that Aurelia isn’t intellectually capable; her character simply seems too no-nonsense. In that respect I was not disappointed for Aurelia’s voice makes sense; it fits perfectly with who she is … even when Morton tosses in a treat here and there. He opened a glazed door at the far end of the glass wall. A narrow ledge protected by a waist-high glass wall with a curled edge metal top rail extended out about a metre from the wall. He was right; the view was spectacular. The sky glittered like a net of white diamonds on navy velvet. At times like this, you wondered if there really were gods on Olympus who could have created such beauty. It wasn’t exactly a surprise to read such a lovely passage, as Aurelia indeed is brilliant, without a doubt. In fact, its sparing placement is in keeping with her personality and realistic presentation of her as a character. Morton’s dialogue is smooth and rhythmic, economic and directed. The author also knows how to keep balance: Aurelia doesn’t run the risk of becoming too perfect because she does, in her worry and fatigue, occasionally overlook crucial bits that lead to new circumstances, for both better and worse. Further character development also occurs as events play out, and Aurelia grows in her awareness, a clever route for Morton to pursue as it lends greater tension to the story as we follow it. I heard a gasp from Mercuria. Numerus came up beside me and stared at Tella with contempt. Before he could do anything, I stalked over to the older woman. My ribs were hurting, my arm aching and my tiredness was making me irritable. But more than anything, fury raced through me at her unreasonable attitude. She’d made a career out of being obnoxious but it was going to stop here. I halted within centimetres of her, almost touching her clothing. […] As I turned my back on her, I was trembling, but I walked away in what I hoped was a dignified way. As fourth in the Roma Nova series, Aurelia nevertheless may be read as a stand alone, and in fact it is prequel to the first three installments. It is easy to see why this is an award-winning novel, action-packed as it is, with Aurelia having to battle just to keep her investigation from being stymied and herself killed as she navigates her way through determination of allies and enemies. We see events through the eyes of Aurelia, gaining insight into the Twelve Families and their relationships with one another, as well as a love interest for Aurelia. 2) The ending was a cliff-hanger and I do not approve of those (even though I am the queen of those when I write...ha This is the fourth book in the series, but worry-not, this does well as a stand alone. Aurelia is book 4 in the Roma Nova series by Alison Morton. The good thing is if like me you’ve come to this series late you don’t need to have read the first 3 books to enjoy this one as the book is a prequel. I loved the pace of this book, it’s so fast paced and easy flowing that you can’t help but sucked in. The character Aurelia was well-developed. She has a military background and is very motivated and driven by her need to show just how much a woman can do without the need of a man. She’s st Aurelia is book 4 in the Roma Nova series by Alison Morton. The good thing is if like me you’ve come to this series late you don’t need to have read the first 3 books to enjoy this one as the book is a prequel. The character Aurelia was well-developed. She has a military background and is very motivated and driven by her need to show just how much a woman can do without the need of a man. She’s strong and while a lot of people respect a woman in a powerful position some still believe a woman beneath them..and she’s loves to wind these people up..some hold grudges. When we first meet Aurelia we learn of her military background but after some family misfortune she must leave the profession behind..family come first. She’s soon recruited to be a spy of sorts, with her background and position in power she’s the perfect agent. Silver is being smuggled and Aurelia soon stumbles upon the person responsible.. but she’s can’t prove it yet. What happens after that is that we are treated to some very interesting twists. We have great characters such as a potential love interest who helps Aurelia..but he’s got his own secrets. There’s the jealous suitor who Aurelia despises and the biggest treat for me was the military contacts she makes throughout the book in her previous military role and her new role. Each very clearly defined, straight-laced but each intriguing in their own right. As I’ve said the book is fast paced but the plot was great, I didn’t think anything was missing and it worked well. I particularly liked the historical edge to the tale, bringing the idea of Praetorian’s and such to a modern-day tale, It really gave it the unique feel. I’m certainly going to pick up the previous 3 books and the series and look forward to more from the author. Her writing style is energetic and purposeful, the characters are always on the move and I loved how things played out. This is a mystery with a historical edge, twists come out of nowhere. I really fell for Aurelia..she has so much to deal with but she’s strong, she will persevere. Most of all I loved how the author managed to make this mystery fun and serious at the same time, at times it’s light hearted at others very poignant. Loved it. "Eyes and ears open, and mouth shut."" This, the fourth in the Roma Nova series, is an exciting adventure featuring a fully three dimensional powerful woman and set in the cleverly constructed alternative historical world of the 1960s. A prequel to the previous three books, it is completely stand alone with no previous knowledge required. It is told in the first person so that the listener is right there inside Aurelia's head, experiencing the action as it happens as well as her emotional reactions as it occurs. The whole carries a feeling of authenticity throughout, both in Aurelia herself and the other characters encountered as well as in her world. Julia Teal's narration is impeccable, her pronunciation crystal clear, the pace brisk but never rushed. She is Aurelia. There is some differentiation of voice, or accent, for other protagonists, but not much, making this more a reading than a performance, and one which is pleasant on the ear. However, for this listener, there was something missing: more than the sometimes odd emphasis in certain Latin words which led to an odd pronunciation, the entire reading never quite came alive, never spoke directly to me. But this is simply personal preference: in no other way can she be faulted. I wish I could remember how this book came to my attention. It's in the middle of a series, but I never felt like I didn't know what was going on. It was very self-contained. Aurelia is a very enjoyable read for a couple of reasons. One: the author did a great job creating a 20th century iteration of ancient Roman culture and tradition. It was subtle (substituting several of the Roman gods as mild expletives rather than using God/god is one of many examples) but effective. Two: the book is very I wish I could remember how this book came to my attention. It's in the middle of a series, but I never felt like I didn't know what was going on. It was very self-contained. Aurelia is a very enjoyable read for a couple of reasons. One: the author did a great job creating a 20th century iteration of ancient Roman culture and tradition. It was subtle (substituting several of the Roman gods as mild expletives rather than using God/god is one of many examples) but effective. Two: the book is very female-centric. The author has created a world in which women run the show, which of course I liked very much LOL. In addition, there are several instances where gender is ignored (using 'partner' rather than 'husband' or 'wife') or situationally flipped on its head (an admin wondering what will be come of the pool of male typing clerks once computer technology replaces them). While there was plenty of action, the language flowed easily yet was intelligent; it didn’t need grisly detail or expletives to make you sit up a little straighter and hold your breath, wondering what was to come next. Toward the end, I actually became worried I might run out of pages before the story ended – I did not. But I was sorry to have come to the end of such an interesting speculative fiction premise. Thank you, Alison Morton, for the enjoyable hours I spent reading Aurelia. Inge H. Borg, Author of the “Legends of the Winged Scarab” Series. Given the title, it will come as no surprise to devotees of the Roma Nova series that Alison Morton now takes us back forty odd years to the 1960s, to meet Carina Mitela’s grandmother Aurelia at a much earlier stage in the life. Widowed, with one daughter, she is trying to reconcile motherhood, duty to family, and her role in the public life of the state. We see the beginnings of the history referred to in books I to III and meet both Aurelia’s nemesis and her one great love. In earlier books, mu Given the title, it will come as no surprise to devotees of the Roma Nova series that Alison Morton now takes us back forty odd years to the 1960s, to meet Carina Mitela’s grandmother Aurelia at a much earlier stage in the life. Widowed, with one daughter, she is trying to reconcile motherhood, duty to family, and her role in the public life of the state. We see the beginnings of the history referred to in books I to III and meet both Aurelia’s nemesis and her one great love. Wow, what a series. If you haven't started this series yet, you are really missing out. Here, author Alison Morton presents a thrilling prequel in the alternative history of the Roma Nova series, the fourth book to be precise, and keeps up all the great momentum and thrill from the first three books. If you've read any of the first three books then you know what to expect, and what you get is exactly what you'd hoped for. First, a disclaimer: I wrote a blog entry comparing Roma Nova with Luxembourg, and the author reposted it on her blog (with my happy consent). Anyway, onto Aurelia. This is Morton’s fourth Roma Nova novel. The first three are a sequence set in the modern day. In the first book, the heroine, Karina Mitela, meets her maternal grandmother, Aurelia Mitela. This book, and the two that follow it (which I have not yet, but will, read) tell Aurelia’s story. Yup, the following books precede the preceding First, a disclaimer: I wrote a blog entry comparing Roma Nova with Luxembourg, and the author reposted it on her blog (with my happy consent). Found it slightly confusing that the fourth book in this series is technically the first book in a prequel series - it takes the reader back to the era of Auerlia, the grandmother of Carina, who's the protagonist of the first 3 books. Aurelia Mitela is the protagonist in this book, who lives in Roma Nova. Roma Nova is a fictitious land - the descendant of ancient Rome – that never encountered the “fall of ancient Rome”; thus, survived into the 1960s. This is the fourth in a series of novels by Alison Morton, about Roma Nova and its progeny. I haven’t read the other books leading up to this one, but I found Aurelia to be very interesting and enjoyable as a stand-alone book. Ms. Morton does a masterful job of describing this ve Aurelia Mitela is the protagonist in this book, who lives in Roma Nova. Roma Nova is a fictitious land - the descendant of ancient Rome – that never encountered the “fall of ancient Rome”; thus, survived into the 1960s. This is the fourth in a series of novels by Alison Morton, about Roma Nova and its progeny. I haven’t read the other books leading up to this one, but I found Aurelia to be very interesting and enjoyable as a stand-alone book. Ms. Morton does a masterful job of describing this version of history, using older weapons and colloquialisms - new terms and technology - blending them with believability and authenticity. There are old Roman swords, newer rifles and guns, state-of-the-art audio and video, old Roman fighting techniques, as well as newer combat methods, mainframe computers, and first-generation personal computers and/or laptop computers. Very interesting is the hierarchy of the lives of Roma Nova’s citizens, the hierarchy of the Praetorian Guard, and the local police force. Women in Roma Novan society are heads of the families and, many times, the military officers who lead the most important operations. Even with women having been in high positions for 1,500 years (the matriarchal system), female officials still encounter sexism, bigotry and chauvinism. Laws and rights of the inhabitants are somewhat different from democracies in America and other democratic nations. Interrogation techniques are more stringent but similar. The most important resource in Roma Nova is silver. Aurelia hails from the silver-rich Mitela family and is heir to the head (her mother) of the first twelve families of Roma Nova; however, living in a society where “everyone” is expected to contribute, she is also a well-educated, fit Major in the Praetorian Guard. She is one tough lady, in combat as well as daily life. She has some issues, but is likeable – if being likeable is important to readers in a main character. This is a story of money, mystery, romance, and action. Aurelia is sent on a secret mission to Berlin to investigate problems with the silver industry, where she encounters an enemy she’s known since childhood. Without giving away the story line, Aurelia gets into trouble and must literally and figuratively fight for her life and the life of her young, delicate daughter -- and save the Roma Novan silver industry. There is danger and romance. I recommend this book to everyone who likes a good mystery/thriller/romance novel. If you like alternate history, this is for you. It is worth the money and reading time. Note: I received this novel in exchange for an honest review. Well what is there not to like about an Alison Morton Roma Nova novel? I guess only one thing - the wait for the next novel to be written and published! Aurelia is the first of the prequel series to the Roma Nova series that is set in the late 1960s. It is about the grandmother to the protagonist Carina. In this series, Aurelia is a high-ranking noblewoman and a Praetorian officer. When she finds out that someone is smuggling silver, she is sent to Berlin to investigate. There she finds that her nemesis, Caius Tellus, is involved in this plot. Aurelia then goes on her quest to pursue him and to capture him. I felt sorry for Aurelia. This woman d Aurelia is the first of the prequel series to the Roma Nova series that is set in the late 1960s. It is about the grandmother to the protagonist Carina. In this series, Aurelia is a high-ranking noblewoman and a Praetorian officer. When she finds out that someone is smuggling silver, she is sent to Berlin to investigate. There she finds that her nemesis, Caius Tellus, is involved in this plot. Aurelia then goes on her quest to pursue him and to capture him. I felt sorry for Aurelia. This woman did not have it easy. She had lost many people whom she loved. The only person that is still living is her child, but she is sickly. because she is emotionally distraught she has given up her job. However, no matter how deep in mourning she is in, she must go back to work. I like how she is curious, for she has a lot of questions that she wants answers to. However, while I did like her character, I thought she was too perfect for my taste. She is a Mary Sue. She does not really have any faults. She is intelligent, strong, and good at fighting.I wish there was more development to her character. Overall, this is about family, friendship, and love. The story is fast-paced and action-packed. It is a page turner that will keep you entertained throughout the book. However, there were some sad scenes that I did not like, and I really did not like her love interest. Even though the ending was a setup for the next book, I do wish that it ended differently. Still, I found the world-building to be very interesting and complex, and it gave us a lot of detail to the world that she created. I felt like I was a visitor to her alternative world. Because this book is a prequel, you do not have to read the Roma Nova series to enjoy this book. I recommend this book to those interested in science fiction, action thrillers, and anyone who like to think about the “what ifs” of famous historical figures and how the world would be different if their lives had been different. If women were in control, the world would be a whole different place, and in the Roma Nova series of alternate history books, Alison Morton sets out to prove this theory. In this latest instalment we go back in time to the Roma Nova of the 1960s and follow the story of Aurelia Mitela, a young woman who has suffered devastating loss. Thinking that her career in the Praetorian Guard is over, Aurelia is sent to Berlin, ostensibly to track down those responsible for syphoning away Roma Nova’s life bl If women were in control, the world would be a whole different place, and in the Roma Nova series of alternate history books, Alison Morton sets out to prove this theory. In this latest instalment we go back in time to the Roma Nova of the 1960s and follow the story of Aurelia Mitela, a young woman who has suffered devastating loss. Thinking that her career in the Praetorian Guard is over, Aurelia is sent to Berlin, ostensibly to track down those responsible for syphoning away Roma Nova’s life blood; its silver reserves. What then follows is a tight and well controlled mystery which takes the reader on a roller coaster of a journey through the politics and procedures of an alternate reality which feels as completely realistic as the world we stand in today. Aurelia is a feisty protagonist, full of the steel and determination we have come to expect from Roma Nova heroines. The scoundrels are villainous to the point of complete nastiness and, in this novel, Aurelia needs to keep all her remarkable wits about her as she negotiates both a political and personal minefield. Drawn into this remarkable alternate world from the beginning, Aurelia is a worthy addition to the Roma Nova catalogue of work and I am sure that this latest story will continue to enthrall fans who are as immersed in this series as I am. Aurelia is book #4 in the Roma Nova series of books about an alternative Europe, one where the Roman empire lives on under the rules of the maternal family lines. What if Rome didn't fall in AD395 and loyal Romans formed a new colony in a mountainous region north of Italy. This book is set in the 1960's and is the story of Aurelia, a Praetorian soldier, after her mother has a bad car accident she finds herself head of one of the 12 families, but she finds there are those who wish to undermine eve Aurelia is book #4 in the Roma Nova series of books about an alternative Europe, one where the Roman empire lives on under the rules of the maternal family lines. What if Rome didn't fall in AD395 and loyal Romans formed a new colony in a mountainous region north of Italy. This book is set in the 1960's and is the story of Aurelia, a Praetorian soldier, after her mother has a bad car accident she finds herself head of one of the 12 families, but she finds there are those who wish to undermine everything they have worked for and so she goes to Berlin as a member of a silver delegation, but underneath she works as a spy, to find who is threatening the vital Silver trade of Nova Roma. I quick and easy read. Having read the fist four in the series however, I was disappointed. The character of Aurelia in the previous books was so formidable that I expected more. Also this being the author's fourth book, I wanted further depth and breath to the story and characters. The portrayal of Aurelia felt exceedingly similar to Carina. Heck, even the plot read exactly the same. Sigh... Not a terrible book really, just not up to my expectations I guess. Go back a couple of generations, and experience the adventures of Aurelia, Carina's grandmother. This was an action packed thriller set in a 1960's Prussia (Germany never unified). While the plot was a little bit predictable, Aurelia's strong relationship with her sickly daughter Marina, and determination made up for it.